I realize this post in my Asian greens series is not exactly a leafy green, but hey, you do what you can. November is the time we harvest winter radishes and wash and sort them. We store the good condition ones in perforated plastic bags in a refrigerator. They store really well this way for several months. Bucket lid with holes for sorting root vegetables for storage. For our other root vegetables we have this bucket lid to help new workers determine what is too small to store. Skinny roots shrivel in storage, so it’s best to eat those up soon after harvest. Winter storage radish doesn’t have its own hole. Deciding what size to store at will depend which variety you are growing. The different varieties can be quite different shapes and sizes. 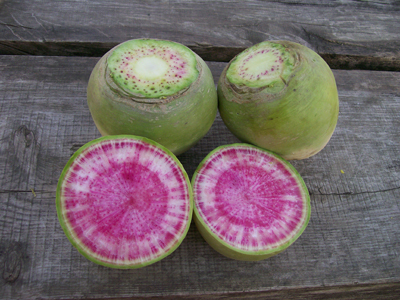 China Rose winter storage radish. We like the red-skinned China Rose, which is a round root, which could grow as big as 4″ in diameter. We prefer them at 2-3″ diameter. 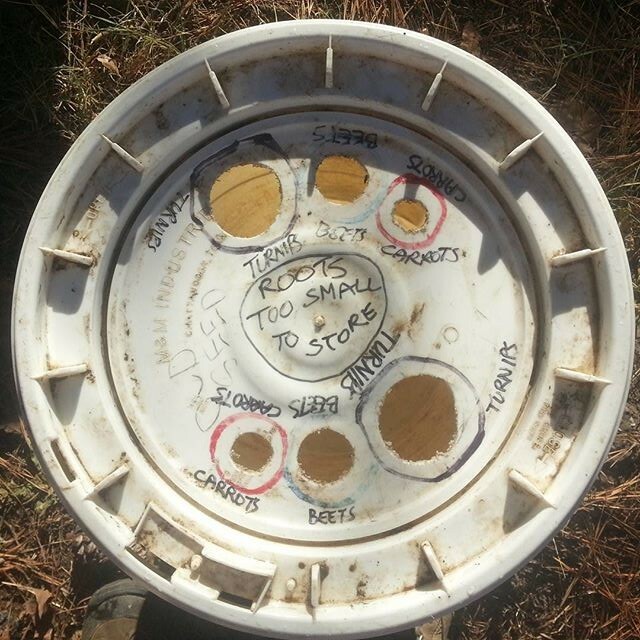 I’d use the “Turnips” hole or the “Beets” hole in our lid. Sow 5-10 weeks before first fall frost. Thin to wider spacing (4-6 in. apart) than regular radishes. Harvest before temperatures drop below 20 degrees F. Trimmed roots can store 2-3 months in the refrigerator or root cellar. 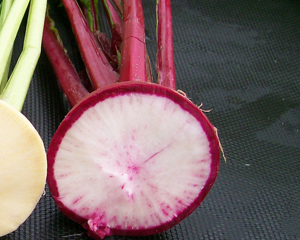 These radishes are daylength-sensitive and should not be sown in spring. Misato Rose is very beautiful. It has an unexciting green and white skin, but inside, a burst of rose and white flesh. Wonderful when sliced or grated for salads. 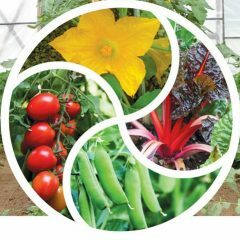 The round roots can grow up to 5″, although I recommend growing them closer and harvesting more of them, in the 3″-4″ range. According to SESE, this is a very forgiving crop – unlike many radishes, this variety will still bulb properly even if over-crowded or thinned late. Daikon (pronounced “dye-con”) is the Japanese word for radish. They are usually harvested when 12″ long and 2″-3″ in diameter, though they will grow much larger! Juicy and flavorful, they can be used fresh in salads (grated or thinly sliced), cooked in vegetable dishes (as you would cook turnips), pickled (as in kim chee) or grated with ginger and covered with soy sauce for a dip. They add a wonderful freshness and crunch to winter meals. 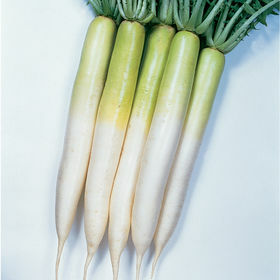 The cylindrical white roots of Miyashige daikon are pale green near the crown and grow 16-18″ long by 2.5″-3″ across. Daikons are brittle – they can easily break during harvest. Fork deeply and lift roots carefully. Those that do snap in half can heal over and store just fine. As well as the true arm-length daikon, there are short stubby “half-long” Korean varieties, for the timid grower. There is one winter radish I’m not a fan of – the Black Spanish radish. This attractive, round white radish with a matt-black skin has had a tendency to become fibrous, when I’ve grown it. If you’ve had success, do leave a comment, telling about your climate and growing method. Winter storage radishes are for July and early August sowing, as they are relatively slow growing. We sow August 4 in central Virginia. Don’t try sowing in spring, they will bolt. One that can be grown year-round is slow-bolting Shunkyo Semi-Long. 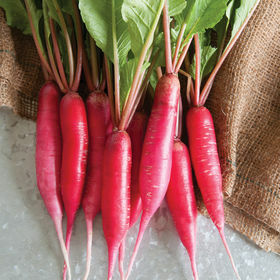 This 4″-5″ long, smooth, attractive cylindrical radish has deep pink roots and crisp white flesh. The flavor is a combination of spicy and sweet. The edible leaves are smooth with attractive rhubarb-pink stems. 10°F: Yukina Savoy, Deadon cabbage, tatsoi, rowcovered scallions. 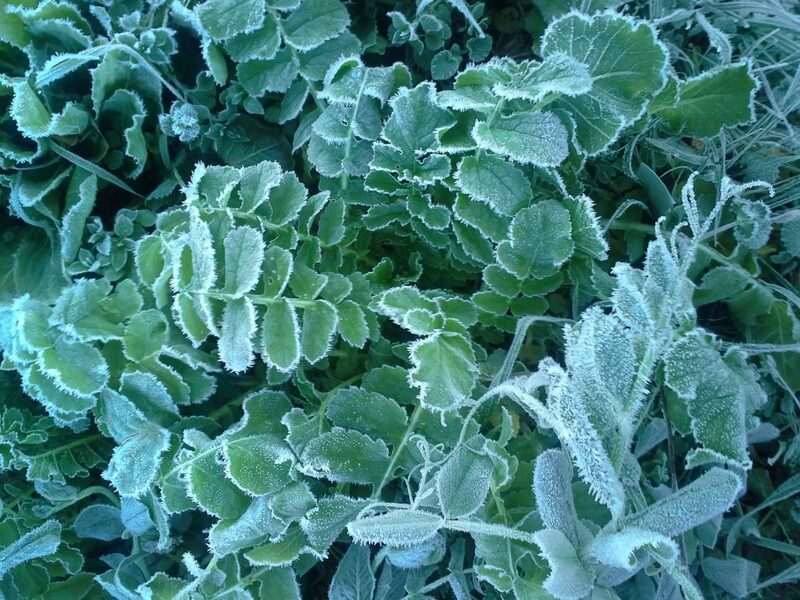 From December our “Asian greens of the month” will be harvested from the hoophouse. Next Next post: What Makes Sweet Potatoes Sprout?